Fast and exact discrete geodesic computation based on triangle-oriented wavefront propagation. As skin shape depends on the underlying anatomical structure, the anatomy-based techniques usually afford greater realism than the traditional skeleton-driven approach. On the downside, however, it is against the current animation workflow, as the animator has to model many individual muscles before the final skin layer arrives, resulting in an unintuitive modelling process. In this paper, we present a new anatomy-based technique that allows the animator to start from an already modelled character. Muscles having visible influence on the skin shape at the rest pose are extracted automatically by studying the surface geometry of the skin. The extracted muscles are then used to deform the skin in areas where there exist complex deformations. The remaining skin areas, unaffected or hardly affected by the muscles, are handled by the skeleton-driven technique, allowing both techniques to play their strengths. 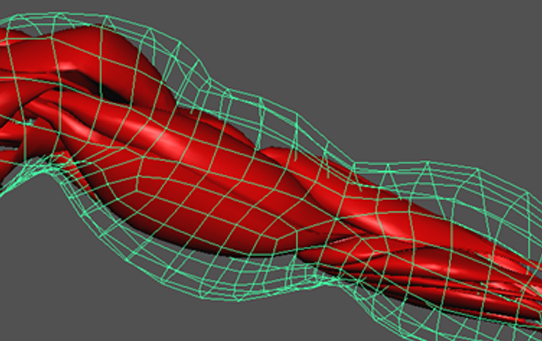 In order for the extracted muscles to produce realistic local skin deformation during animation, muscle bulging and special movements are both represented. Whereas the former ensues volume preservation, the latter allows a muscle not only to deform along a straight path, but also to slide and bend around joints and bones, resulting in the production of sophisticated muscle movements and deformations.